For me, what you do before you go to bed, is just as important as what you do when you first wake up. I’m a morning person. Generally, I’m up by 6:30am. And feel most productive when I have finished at least a 1/3 of my to-do items before noon. But given the amount of stress that I’ve been under lately, I’ve begun to take some time to myself at the end of each day too. I evaluate how the day went, what progress was made and make plans for the following day. Lately, I’ve become more intentional about establishing 5 or 10 minute rituals for myself that ground me and really cause me to think about my most immediate needs and how I will achieve them. And also, allow me to think deeply about if the actions that I am taking are bringing me closer to my “ideal life.” What rituals have you created for yourself? How are you bringing yourself closer to achieving your goals, dreams? When I turned 30, I made the decision to devote a portion of each new year of my life to the craft of learning at least one new skill. This year, by December 31st, I plan to be at minimum highly proficient in spoken and written French and have a deep knowledge in building websites. During this process of learning at least one new skill a year, I’ve learned a lot about myself. Namely, how I best learn new things, how quickly (or slowly) that I can learn and how to best utilize this new information moving forward. I heard about Timothy Ferriss a few years ago. The author of several successful books, most notably The 4-Hour Workweek, The 4-Hour Body and The 4 Hour Chef, he mainly discusses the process of learning something new, particularly how to learn something new in the shortest time possible with the most efficacy. I am a big proponent of the idea that you should never stop learning, especially something new. I have a ton of new things that I want to learn. The things on my short term list would be: Spanish, coding, how to swim, krav maga, and the tango. What are the new skills that you would like to learn? What best practices have you learning that anyone can apply to learning something new? 1. The Great Gatsby — This is the book that I am reading now for two reasons: in anticipation of the movie to be released on May 10th and in preparation of my book club discussion this Sunday. I haven’t read this since high school so I am enjoying re-reading it. 2. Blog, Inc. — I’m perpetually intrigued with how people have managed to turn passion (and side projects) into profits. I’m hoping to gain some new insights from this book. 3. Narcopolis by Jeet Thayil — I heard about this novel after reading a NYTimes interview with Katherine Boo. I’m a fan of her writing and a recommendation from her goes a long way with me. 4. Pushback: How Smart Women Ask — And Stand Up — For What They Want by Selena Rezvani — I heard about this book after reading a post on Jezebel. I’m particularly interested in learning about best practices regarding negotiation. 5. Barbara Kingsolver’s Flight Behavior — Kingsolver has been a very successful writer doing something a lot of writers haven’t been able to do — establish both critical and popular success. A few posts back, I blogged about reading books included on the New York Times top 100 list and this book is one of them. 6. The Flame Alphabet by Ben Marcus — The premise of this book sounds super interesting — an epidemic occurs in which the voices of children have become suddenly lethal to adults. An incredibly original concept, I’m really interested to see how Marcus brings this world to life. 7. 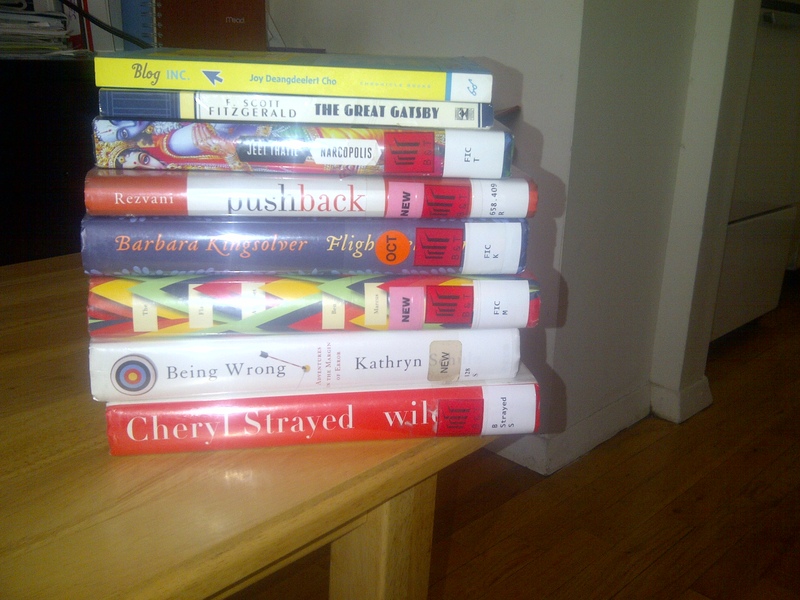 Being Wrong: Adventures in the Margin of Error by Kathryn Schultz — This was another book recommended by Katherine Boo. Also, I have read some of Schultz’s other work and find her to be a fine writer. The premise is also interesting to me — why do people have a desire to be right all the time? 8. Wild: From Lost to Found on the Pacific Crest Trail by Cheryl Strayed — I saw an interview that Strayed did with Oprah and become intrigued. Similarly, the book has gotten so much press that it peaked my interest. 9. The Handmaid’s Tale — I’ve never read this book. Given the current politics surrounding reproductive rights, I feel like this book is a prescient, timely choice. 10. Plutocrats: The Rise of the Global Super Rich and the Fall of Everyone Else by Chrystia Freeland — I’m interested topics regarding wealth and the wealthy. I’ve heard a lot about this book and want to give it a try. What’s on your reading list? Happy Reading! 1. Prioritize self-care. When I’m stressed, its very difficult for me to eat well, especially several times a day. I subsist on coffee and maybe a small snack per day. But this is way too little and not healthy. Its of paramount importance to prioritize your health while going through a stressful, difficult situation. In not maintaining your health, you compromise your ability to fully make it through your current circumstances. 2. Take a moment each day to express what you feel. Every day, I cry. I take a moment to myself to just release what it is that I am feeling. But I only give myself 10 minutes to do so. Whether, its in the morning or at night or sometime during the day, I do it. And then move on. 3. Do 10 things every day to move yourself forward. You have to fight for the life you want. Life may look different after bad news, but you have to push through it. Staying busy has really been a godsend for me. Doing 10 things every day that will take my life into a different place, has allowed me to take some sort of control. 4. Celebrate small victories. It could be a hello or a kind word or basically anything. But being present in the moment to acknowledge the good and the positive is an excellent strategy when it seems as if life has thrown you bad lemons. 5. Exude the opposite of what you feel. In other words, the more anxious, worried and sad that I feel, the happier, friendlier and more generous I have decided to become. 6. You may not choose what happens to you but you can choose how you will respond. Early on, I made the explicit decision to choose to learn from these experiences and that this sort of thing happens to people every day. I am no different than anyone else. 7. Surround yourself with a support system. The only thing worse than going through this would be going through this alone. Don’t walk through something like this by yourself if you don’t have to. 8. Have faith. I have leaned quite heavily on my own faith during this time. As many do when things are not good. But I don’t think this caveat applies to just the religious. I think having faith in that life happens to everyone and that life is series of ebbs and flows can be a powerful realization. Things can be great, things can be miserable. Know that this too shall pass. The above video is an interview with comedienne Tig Notaro. Her career is on the rise, thanks to a resounding endorsement from the formidable Louis C.K. But before all the recent accolades came her way, she experienced the following: a bad breakup, life-threatening pneumonia, her mother’s death, and then being diagnosed with breast cancer and undergoing a double masectomy. Yet Tig managed to survive it all. How you respond to difficulty has a huge impact on how you will move through it. The choice is yours. It will make a significant difference in everything you do. Be (more) interesting. Interesting can take different forms. Find what is authentic to you and makes you stand out. Hone in on that. Perhaps you’re funny or slightly mysterious. Maybe you are deeply intuitive or a bit eccentric. Whatever it is that makes you tick, use that and make yourself more interesting. If there is one thing that will kill any sort of relationship or interaction, its being a bore. You should know by now that Marie Forleo is one of my all time fav success stories. As an entrepreneur, she has established a platform that’s inspirational, eclectic and open. The above is a video she did with “fascination expert (I love it!) Sally Hogshead. Sally makes the point of saying that everyone has the ability to be fascinating. One tip is to start with something external. Perhaps its a cool or vintage piece that you can add to your ensemble that will be a conversation starter. I’m currently growing an afro. A huge one. Make yourself interesting externally someway while crafting your inner diva (or divo). Be (more) interesting! Yesterday evening, I read a very interesting article over at the Wall Street Journal called “Why Divas Need Make No Apology.” The article deconstructs the meaning of “diva” into both negative and positive traits. In contemporary pop culture especially, diva seems to take on a slightly derogatory meaning. It tends to describe someone who is demanding, arrogant, and always needs to be the center of attention. But this article posits that “healthy divas” have a great deal of traits that others could learn from. Firstly, they always demand their worth and never settle. Secondly they advocate for themselves and others. Thirdly, they are hard workers who believe in themselves and exude confidence. I included the most recent commercial by pop superstar and diva Beyonce above. Whether you are a fan or her or not, Beyonce knows how to command an audience and she knows her worth. As I push through to the next phase of my personal, professional and financial lives, I’m going to find my inner diva. And release her!